The monster behind the dryer!! When was the last time that you cleaned the lint out from behind your clothes dryer? 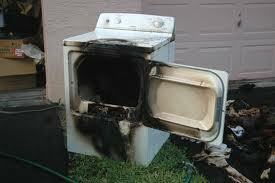 Every year, approximately 15,000 fires* are caused by lint buildup in dryers. Lint, which is highly combustible, must be cleaned from the lint filter after each load to allow air to circulate freely through the dryer. • Periodically clean the back of the dryer where lint can be trapped in the venting system as well as around the electrical outlet twice a year. 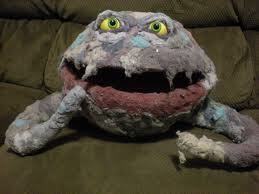 • Occasionally remove the lint filter and clean it with a nylon brush and hot, soapy water. • Keep the area around and on top of the dryer clean and free of clutter. • Have a qualified service person clean the interior of the appliance and venting system once a year. 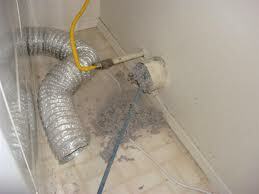 • Thoroughly clean the vent system if you notice your drying times have increased. • Use rigid or semi-rigid sheet metal venting material, never plastic. • For best dryer performance, use the shortest, straightest vent length possible, and use a louvered or box hood style to cap your vent outside. • All dryers should be vented to the outside and be sure you can feel air flowing out of the vent to the outdoors when the dryer is on. • Inspect the venting system behind the dryer and replace any pieces that are damaged or crushed. • Always follow the manufacturer’s instructions for installing the dryer and vent system. *Content shared from Canadian Residential Inspections. I’ll bet that you are about to pull out your vacuum cleaner now and give your dryer the once over. Do you have an Elf on the Shelf? 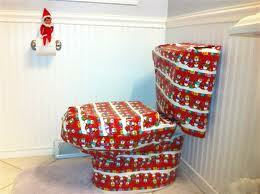 I haven’t fallen victim to the Elf on the Shelf craze yet, but I’m seriously considering getting our kids one this year. 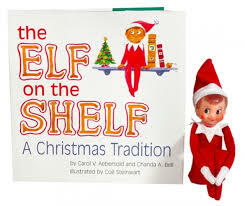 The story behind Elf on the Shelf, is that he or she is a scout sent from Santa that gets adopted by a family to watch over the kids and report back to Santa of the naughty or nice things that the kiddos have been up to. Every morning, during the holiday season, the kids get up and find the elf in a new position around the house. There are several sites that give parents suggestions of what this little sprite can get in to each day leading up to Christmas Eve. A present to wake up to. 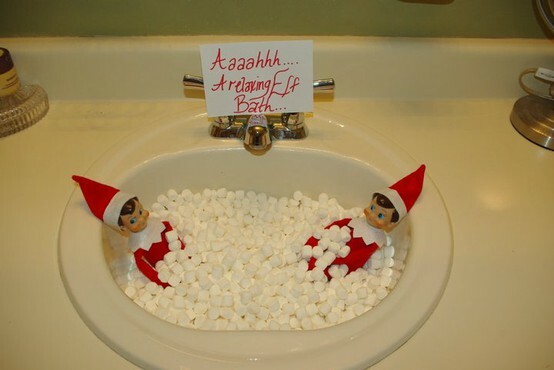 I’ve seen loads of ideas for all the naughty situations that this little elf can get in to. Want your own Elf on the Shelf ? We’ve recently been given some chocolate bars to sell to raise funds for our daughter’s preschool. 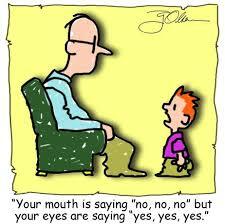 Who can say “No!” to a kid? I remember having to sell chocolate bars when I was a kid too. My Mum would take them in to work and they’d all be sold in no time. Now, for my kids, I am a Stay-At-Home-Mom, so I have no co-workers to sell them to and my husband works from home, so he also has no one to dump them on. With Halloween just leaving us in it’s wake, family and friends have no interest in obtaining more chocolate, and being $3/piece, who in their right mind would buy one? I think it’s time for a change in what “they” want kids to sell to raise funds for something. For one, people are cheap, so make it affordable. Secondly, stop with the junk food! 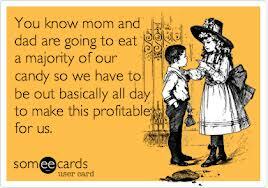 Times have changed and we are more mindful of what we put in our kids bodies as well as ourselves. And they’ve got another thing coming if I’m going to buy chocolate, just to turf it in the bin. I think schools should really do a better job at promoting healthy eating when conducting fundraisers. Have you heard of DASH? 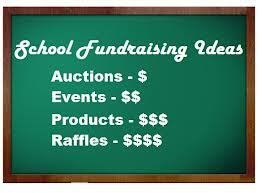 Check out their guide for Healthy Fundraising for Schools. It’s up to us as parents to speak up about what is acceptable when it comes to our kids. I understand that schools, organizations, and groups fundraise to help cover their costs, but make it worth the purchaser ‘s dollar. 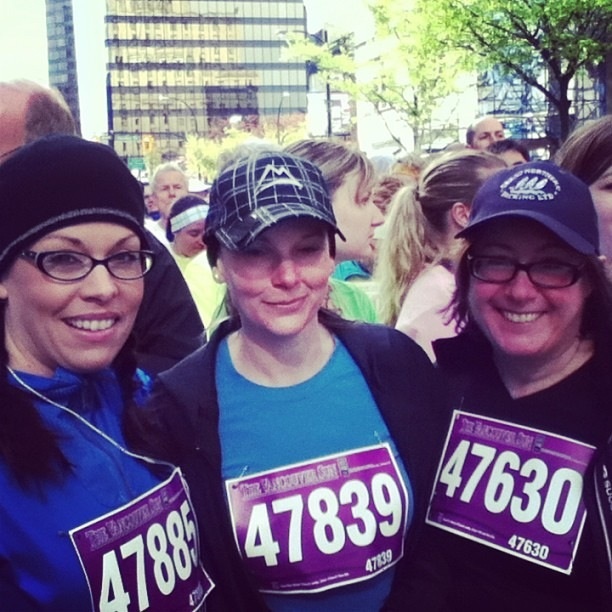 Back in January, I started training for the Vancouver Sun Run. This is a 10K run, that takes place in downtown Vancouver and weaves it’s way through English Bay and False Creek. I have always disliked, nay, loathed running! Never being a “fit” looking woman from puberty to current status (I have also given birth “naturally” to two children), I have struggled with being overweight. 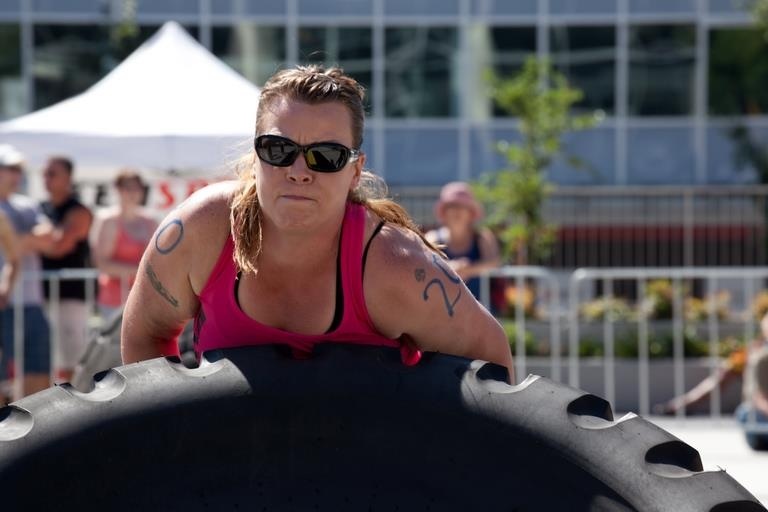 Just before my daughter turned two, I trained and participated in Femsport, an all women fitness challenge, which kick started my journey into fitness. After Femsport, I started spinning, and took Zumba classes. I began to see results within a couple months and I was feeling great! Then it happened, I got pregnant. My energy level dropped. Blah, I felt so crappy that I couldn’t fathom exercising. Galdarnnit, I was doing so well with staying motivated to workout, but alas, my body decided otherwise. Jump ahead 9 months, and we welcomed our wee little dude. Labour and delivery went awesome and I was keen to jump back onto the fitness bandwagon ASAP. I started off by spinning again, then the personal trainer that I did Femsport with, Margaret at MaxPo, said that she was going to start a running group and training for the Sun Run in January. I pondered it for awhile. My sister is a runner and my husband used to run as well, and they both had said for years, that running was the best way to lose weight. I figured, well it’s worth a shot. I’ve never tried it, so what the hey. January arrives and the group begins. To my surprise it was very easy. We started off slowly by running for 1 minute, walking for 2 and repeating this several times. We were given homework runs to complete on our own before we met up again as a group the following week. Gradually the length of the run times increased and my stamina did as well. Eventually, I was able to run straight for 40 minutes! Are you kidding me? I never dreamed that I could manage this. After 5 months of run training, the BIG day arrived for the Sun Run. I was nervous and asked my Facebook friends to cheer me on virtually through my Nike+ running app that I had on my iPod. Throughout the run, my friends cheered and it brought tears to my eyes, but it kept me motivated and I finished the run with a time of 1 hour 10 minutes. I kept up the running for awhile, but my husband travels out of town for work, so it impeded my run schedule. I am full time Mom and we don’t use babysitters or have family members available to look after them, so whatever I do, I have to do it with 2 littles in tow. If you break for too long, your motivation slips and your endurance starts to dwindle. I recently started working out with a local studio, however my family’s schedule began to conflict with my workout schedule, so I had to discontinue my training which really sucked. After taking a break from running for a couple of months, I have started it up again. I forgot how good it felt to get out and just be focused on myself. 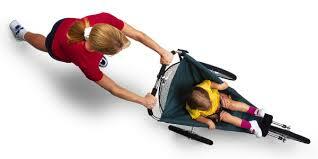 I can run when I can fit it in, and I can take my son out with me in our recently acquired jogging stroller. The weather has become chilly with the onset of winter, so precautions are made so that I remain safe while out on my run. I wear a headlamp, a flashing armband and reflective clothing. I have also placed some Dots and Dashes on my gear, to increase my visibility during my night time runs. My goal is to get out every day for an hour and hopefully the momentum will stay with me. I started wearing make-up back in Elementary school. The start of becoming a woman. Not because I needed it, but because the tween magazines back then were very popular amongst the girls in my school and they contained “How-To’s” for putting on make-up and which colours suited your eyes, etc. One of my best friends would always get the coolest gifts for her Birthday and Christmas, usually which consisted of a multi-colour make-up compact complete with everything required to put on a full face of make-up. We would go in to the girls bathroom with her make-up and the tween magazines and try to re-create what we saw on the pages and for the most part (at least in our 11-12 year old minds) we looked good. What pre-pubescent boy wouldn’t take interest and want to sneak in a kiss behind the bushes after school? This was my introduction in to the world of cosmetics. 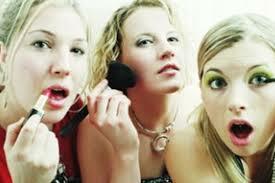 Upon entering the institution of high school, I noticed that more girls were wearing make-up and had their hair done nicely. These were the popular girls. I wanted to be one of them. I would get up early everyday and make sure that my make-up was perfect and the not a strand of hair was out of place. It didn’t make me popular, but I felt that it kept me in the “neutral zone”, so that I wouldn’t get picked on. I still got picked on, but not because I was “ugly”, but because I was overweight. Teenagers can be so cruel. I remember being in grade 9 and a cute boy asked me to be his girlfriend. He was a nice guy and I really liked him. He would come to my school after class and wait by my locker for me. 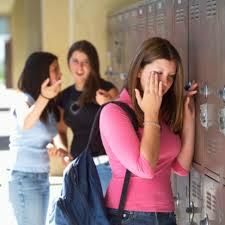 The popular girls couldn’t believe it and even tried to convince him that they’d be better off with them instead of me. He didn’t fall for it. I thank him for that to this day. Jumping ahead a couple of years to grade 11, I was in an art class and the project that we were doing was to take plaster cast material and make a mask of our face to later paint. I was mortified and on the verge of tears. I would have to be make-upless in front of my classmates and one of the most popular guys, that picked on me, was in my class!!! After everyone started, I went up to my teacher, discretely, and expressed my fear. She sympathized with me and suggested that I come in before school started the following day and she would do it for me and I would have enough time to put my face back on before anyone saw me. If anyone asked me who my most memorable teacher was, I’d definitely have to say her because she was the most kind and helpful woman to me during my most trying years. 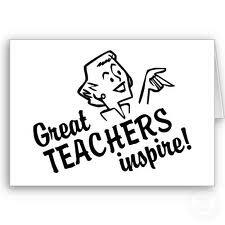 This is also the teacher who suggested that I take a Make-up Artistry Program once I graduated. Which I did. Funny enough, I didn’t take the course because of fashion make-up, it was because I wanted to do the Special Effects Make-up. Now THAT is my passion. So after completing the Make-up Program, I managed to get a few jobs, but they were VERY boring ones. Subsequently, this led to the demise of my Make-Up Artist career path. I did not want to work at a cosmetics counter. Jump ahead 19 years, and the idea of being a MUA gets rekindled. I have spent all these years perfecting MY look, so I am familiar with day make-up as well as evening looks. But cosmetics have come a long way since I finished school and the techniques and cosmetics themselves have evolved and I am standing here unfamiliar and overwhelmed. The investment in starting up a Make-up Artistry business is a pretty big one because there are so many different skin types and skin colours, that your kit would be massive to accommodate all your clients. I think for the time being, I’ll stick to being my own make-up artist. Do you go au naturel or would you not be caught dead going out without “putting your face on”? Getting fit with kids in tow. Now that I’m done having kids, I seriously want to get into shape. I am a full time Stay-At-Home-Mom. My kids go where I go, so I need to include one, if not both of my kids into my workout schedule. Fortunately our eldest goes to preschool three times a week for a few hours, but that still leaves me with our 1 year old to hang out with. He’s started to drop the morning nap, so now I can take him with me for workouts. Now I just need to find something that will allow me to workout while he’s with me. I know the rec centre has child minding, so that is an option. There are also some studios that offer it as well. I tried a facility that has an area for the wee ones to hang out in by themselves, but Captain Clingy wanted nothing to do with that. I’m thinking that I need to pick up a jogging stroller. I can take the wee man along with me, he doesn’t weigh too much yet and running is FREE. On the down side, I’ll have the weather to contend with. Now that Old Man Winter is approaching, we’ll have to deal with the cold, rain, ice and possibly snow. Could get treacherous. I wonder if there are indoor tracks to go to? I suppose I could also pick up a fitness DVD and do workouts at home, but our space is the size of a closet and I think that if I fire up the Jillian Michael’s Kickboxing DVD that’s been collecting dust on the shelf, I’ll either kick my son clear across the room or end up with my foot firmly planted in the TV. Maybe I’ll pick up these 10 Minute Solution DVD’s that I just came across. There’s bound to be something in there that’ll work for me. How do you stay fit whilst caring for your young ones? Does candy make kids crazy? We still have a massive haul of candy left over from Halloween. I’ve been letting her have a couple of treats each day, but I sincerely believe that it’s turning her into a monster. I decided to cut her off for a few days and I noticed quite an attitude change from spazzola to average 4 year old (if there really is a difference). Hubby and I have guiltily been pecking away at the pile in hopes that our daughter won’t notice the dwindling mound. I don’t want her eating that much candy. A treat once in awhile is OK, but at that rate, we’ll still be eating this junk until her 16th Birthday. Honestly..we’re just trying to help! And I don’t think that this plan will work either. Mom and Dad’s waistline’s are starting to grow and I have noticed a few more pimples. 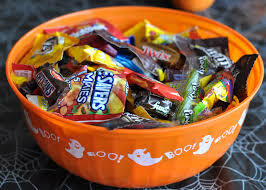 I decided the other day that we MUST THROW AWAY THE CANDY! Sad and wasteful yes, but our bodies will than us for it later. Not to mention, we won’t be buying the dentist a new car anytime soon. 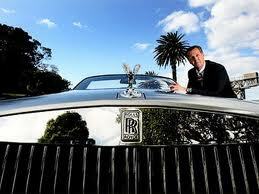 Yes, you do need several crowns and veneers!